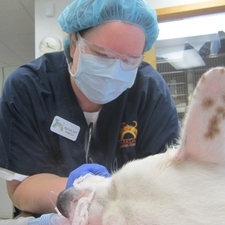 Dr Betts came to Manistee in 2008 to run Parkdale Animal Hospital with her husband, Roger. They love Manistee, Parkdale Animal Hospital and their furry charges. They have 2 dogs and 2 cats - all cast offs that they fixed up and gave a happy home. Dr Betts is particularly passionate about preventive care, zoonosis (diseases pets can give to people) and emergency surgery. The emergency part is no surpise given Dr Betts was a paramedic for 10 years! Doctor of Veterinary Medicine from the University of Florida. Dr Betts loves preventive care and emergency surgery. Roger is an unofficial member of vet school as he went to many classes with Dr Betts. 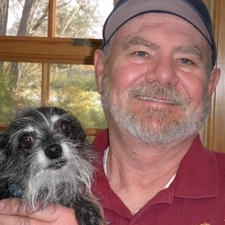 As Director of Lodging, Roger is like the cruise director for your pet's stay with us. A woods walk or a beach adventure is right up his alley. He makes sure big dogs, dinky doggies and cats of all temperaments are putty in his hands. So rest assured your pet will have so much fun in lodging while you're in Maui. He also is invaluable in an emergency as he was a firefighter for 20 years! Little dogs have a way of recognizing their king and Roger's one of those. Don't despair big dogs, he loves you, too. But little dogs are putty in his hands like no other! Linda, a Manistee native, is glad to be part of the Parkdale team. She has always had a great passion for animals and now she enjoys working with them every day! 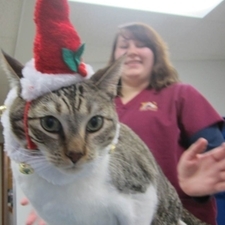 Not to mention being the main decorator of our clinic cat, Phil. Linda: Soothes the savage beast! Linda's worked for two years to win the trust of her cat Monty who was a stray that hung out in her yard. Now he's living the life of a king and has no interest in going back outdoors. As the mother of two active boys, coming to work to care for the four-legged variety is a break! Darcee makes sure your pets are safe, comfortable and having a great time in lodging. 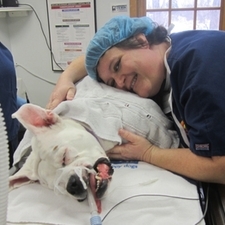 Darcee also is a great surgical assistant and loves cuddling the patients as they recover from surgery. 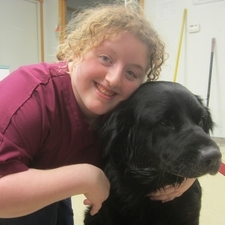 Darcee knows what it takes to care for a special needs dog, as her dog is blind. 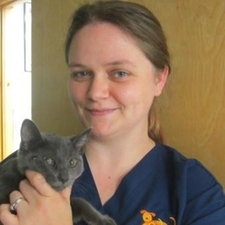 Rachel is glad to be back in Manistee after obtaining her degree in Veterinary Technology from Baker College. She and her husband spoil their 90-pound lap dog, She-Ra, with lots of love and activities special to Manistee. Licensed Veterinary Technichian, Baker College. Audi is a Manistee native so you've probably seen her around town. When Audi is not making sure your lodging pets are having the time of their lives, she is a student at West Shore Community College. Kik, her cat at home, keeps her plenty busy with all his hijinks! Audi loves reading books so much she could spend the whole day reading and not get bored. Becky was born and raised in Michigan where she developed a love of animals from a young age. When she's not at Parkdale taking care of your pets, she enjoys spending her free time with her hubby, three small children and 3 pets of her own. Becky always makes sure your pets are comfy and happy with lots of cuddles. Dr Friedburg started Parkdale Animal Hospital in the early 1980's after many successful decades in practice elsewhere. After retirement he spent his days with his wife, Donna. Sadly they have both passed away. 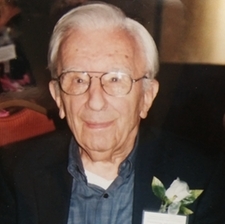 Dr Friedburg was very active in the local Rotary Club. 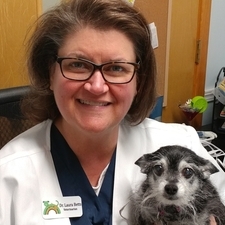 Dr Iler and Dr Biggs ran Parkdale Animal Hospital for 19 years before retiring to Tennessee - they deserve the best after working so hard! 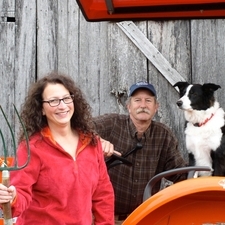 Zellie makes sure the farm runs smoothly! !